The writers and editors at HuffPost Taste are apparently "in favor of veganism". They aren't, you know, vegan, but they do occasionally write pieces on the topic. The latest, by Alison Spiegel, is titled "Taste Test: Friends Don't Let Friends Eat Vegan Cheese". It evaluates seven vegan cheeses and concludes that they are "a crime no one should commit". I haven't tried the varieties sampled by HuffPost, but I have definitely eaten unpleasant vegan cheese. This is an area poised for growth. The market ten years from now will look much different, just as current offerings are better than those of the past. Many people happen to enjoy Daiya Shreds, which only recently became widely available. In the past two years several vegan cheese cookbooks have been published. They contain original ideas not yet incorporated within commercial products . Spiegel says she "still has hope" for vegan cheese, and I think that is wise. But I'm not here to defend vegan cheese. It doesn't interest me very much, partly because I don't miss dairy cheese. Beyond that, I'm disturbed by any attempt to imitate a nonvegan product. Why would anyone want to replicate the sensory experience of something derived from suffering and death? The answer, of course, is that we find comfort and joy in the familiar and traditional. Unfortunately, most of us weren't raised vegan. Perhaps this explains why I pour plant milks on my cereal. I'm thankful they don't taste like cows' milk, but there would certainly be a market for those that do. It would be nice to leave behind all vestiges of the nonhumans as food paradigm — to stop pursuing the perfect vegan cheddar and develop our appreciation of the countless other culinary possibilities offered by fruits, vegetables, herbs, spices, legumes, grains, seeds, and nuts. I worry that we suggest, or start to believe, that the vegan revolution hinges on people tinkering away in kitchens or labs, rather than people educating everyone they can about their moral responsibility. “What is needed [...] is acceptance of the idea that animal emancipation is a desirable aim. If a sufficient number of people experienced such a mental conversion, then the skills and ingenuity of men could be used to develop alternatives to those products of animal origin which the majority of men undoubtedly believe to be essential to their well-being. These products — a completely satisfactory non-animal milk is an example — are necessary if the universal practical application of the ideal is to be achieved. For men and women are not all alike and there are many for whom the practical obstacles must at present seem insurmountable. We cannot shut our eyes to the undoubted fact that to such people such obstacles are real and not imaginary. Substitutes for nonvegan products have come a long way since the time of Cross. Yet new vegans can't just switch to indistinguishable imitations of their favorite exploitive things. And, because the replicators and holodecks of Star Trek aren't on the horizon, this will be the case for decades to come. Those who loved visiting the zoo will have to try a park instead. Those who enjoyed wearing silk ties will have to buy ties made of other fibers. Those who loved dairy cheese will have to find other things to eat. This might include vegan cheese, but our palates simply can't be satisfied in the exact same ways. Food can be a source of tremendous pleasure for vegans, but personal adjustments are required. This kind of reaction should be expected so long as most animal groups and advocates don't discuss veganism as a moral obligation. Spiegel puts it in the category of "dietary or allergy restriction". Most readers have no context for understanding this taste test, which assumes dairy is the norm and vegans are denied the indulgence for some unknown or unimportant reason. Here is the missing element: Vegans are compelled by the immorality of nonhuman exploitation. Most of us don't consider dairy products to be food. We don't want to eat them; we can't eat them. 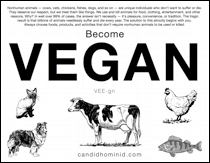 Appealing substitutes for nonvegan things do make veganism more approachable for some. But, ultimately, we have everything we need to be happy and healthy right now. We should all be expected to avoid nonhuman exploitation — regardless of when new products might hit the market. So does it matter if vegan cheese is terrible? Sort of. Ideally it would be incredible, but we need not put the vegan movement on hold. If someone is vegan for moral reasons, they won't be perturbed by the claim that some vegan cheeses taste like "pencil erasers and grandma's corked homemade wine". I understand the impulse behind these claims. It would be helpful if we could tell people that when they select food their choice is between X (derived from suffering and death) that tastes like Y... or Z (derived from plants) that also tastes like Y. Because they both taste like Y, you might as well select Z (eat vegan)! In truth, your choice is between X (derived from suffering and death) that tastes like Y... or Z (derived from plants) that tastes like V. You should choose Z because it's the right thing to do. Z doesn't taste exactly like X, so you will have to adjust your palate and expectations. By way of analogy, we aren't in a position of offering people a choice between two glasses of water that taste the exact same but have different origins: one is distilled river water and the other is distilled tears from tortured toddlers. It's more like we are offering a choice between distilled river water with a squeeze of lemon and distilled tears from tortured toddlers. Morally, of course, the choice is clear. But there is definitely a difference in taste that some will find disagreeable (at least at first). We shouldn't lead nascent vegans to believe they can have the exact same sensory experiences as their nonvegan selves. They can't. Plants offer nearly endless culinary potential, but they can't be made to replicate the flesh and secretions of nonhuman animals. In many cases they can be made to approximate nonvegan foods, but there are usually noticeable differences in taste, texture, and/or smell. Let's keep it honest and always focus people on the moral issue: unnecessarily exploiting nonhuman animals is wrong. New vegans can eat awesome food, but it will be different than what they are accustomed to. And even if vegans could only eat bland and boring food, we would still be morally obligated to be vegan. Search Amazon for "vegan cheese". Food bloggers are also contributing recipes. What time does the Masters start?